A little earlier than we would have anticipated this year, the lovely white snowdrops (Galanthis nivalis) are coming up thick and fast in vast numbers. The appearance of the winter aconites (Eranthis hyemalis) also seems hard to predict. Some years they are come and gone before the snowdrops, other years they flower simultaneously. Even the hellebores are early, with many in flower already. In shades of white, yellow, pink and purple their demure, nodding flowers are like little jewels. We have been increasing their numbers year on year in our Winter Walk (Adrian’s Walk) around the north end of the lake. Luckily for us all their flowers last comfortably into late Spring. 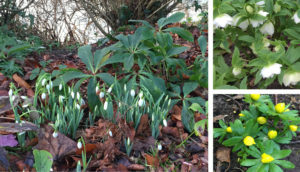 All are a sight to gladden the heart at this time of year when we are short of colour and excitement in a monochrome landscape; a reminder that despite the cold and damp many plants are awakening under the soil and Spring is not too far away. We are open for 7 weeks this year from 9th February and closing with our annual Easter Egg Hunt on the Friday 30th March. With our Potting Shed Cafe open every day 10am-4pm.